Only a few years ago there wasn’t a film reference book anywhere that included the name of Oscar Micheaux. Now he’s on a stamp. The US postal service has issued the stamp honouring the African-American filmmaker as part of its Black Heritage series, alongside such luminaries as Harriet Tubman, Martin Luther King, Jackie Robinson and Scott Joplin. 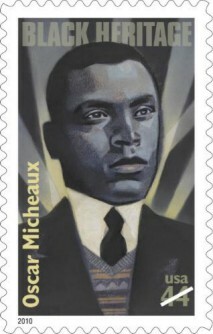 Few photographs exist of Micheaux, and the image by stamp artist Gavin Kelley is taken from the portait of him that was included with his 1913 novel The Conquest. Oscar Micheaux (1884-1951) was an author and filmmaker, who directed over forty films for black audiences between 1919 and 1948. He first started to attract the attention of film historians and historians of African-American life when a print of his 1924 film, Body and Soul, starring Paul Robeson, was discovered. However the real interest got underway in the late 80s/early 90s when prints were discovered of Within our Gates (1920), Micheaux’s controversial work on racism (white and black) in America, and an incomplete The Symbol of the Unconquered (1920), on the Ku Klux Klan. The discoveries encouraged the unearthing of other films made by African-American directors in the 1920s and 30s, and histories, biographies, filmographies, screenings and DVD releases have followed. For information on Micheaux visit the Oscar Micheaux website, or for reading you can take you pick from Patrick McGilligan, Oscar Micheaux: The Great and Only: The Life of America’s First Black Filmmaker, Pearl Bowser, Jane Marie Gaines, and Charles Musser (eds. ), Oscar Micheaux and His Circle: African-American Filmmaking and Race Cinema of the Silent Era, Pearl Bowser and Louise Spence, Writing Himself into History : Oscar Micheaux, His Silent Films, and His Audiences, or the American Film Institute Catalog Within our Gates: Ethnicity in American Feature Films,1911-1960. Of his silent films on DVD, Body and Soul is available as part of a Criterion Paul Robeson collected set, while Within our Gates is available from Grapevine as a DVD-R. It’s good that it’s available at all, but ever there was a silent film that deserved the handsome treatment that the major labels can give, this is it. The low-budget nature of Micheaux’s films inevitably narrows their audience now, but we have to look beyond what a film cost to what it tried to express, and to appreciate the huge hurdles that Micheaux had to overcome to sustain a film and writing career over such a long period. It is good that he is written about, that he now turns up in the reference books, and that he is going to appear on envelopes, but no filmmaker can survive unless he is seen. How about a double-DVD set one day of Birth of a Nation and the the film that Micheaux made to counter D.W. Griffith’s abhorrent vision, Within our Gates? The double-DVD of “Birth of a Nation” and “Within Our Gates” is a very good idea. Can you think of any existing point-counterpoint DVDs? It would be an interesting category. I hope someone will put together an Oscar Micheaux biopic. I can’t think of any point-coungterpoint DVDs like that. Maybe sometimes an extra on a DVD may express a contrary point of view, but not a second DVD that offers a different view to or critique of the first.